The normally high pitched snarl of the rented V Star 650 motorcycle escalated suddenly to a raspy scream, signaling an RPM way beyond a healthy range. The dramatic change in pitch shouted to my muscle memory “You’re revving way too fast! Shift up!” Reflexively, my left hand pulled in on the clutch as my toe slipped under the gear shift lever to move to a higher gear. At the exact same moment, my steady climbing movement up the steep hill slowed dramatically, giving my body a competing message. “You’re moving too slow for this gear. You need to downshift!” In the tiny fractions of a second that seemed to persist much longer, both hands and both feet performed an awkward dance trying to use the clutch, gear shift and brakes in the right combination to subdue the inner conflict. As quickly as the emergency response got started, it vanished in the realization that the only action that mattered right then was holding tightly on the brake lever with my right hand. I didn’t need to shift up or down because I was in no gear at all. The racing engine and lack of movement confirmed the bad news. My clutch was fried. Not the best of moments for that to happen as I was about half way up one of the steepest streets I’d ever been on, a straight stretch of San Francisco’s famed Lombard Street between Polk and Larkin Streets. The only thing keeping me from rolling down the hill backwards was the firm grip on the brake, yet I needed to let up to gradually roll into a reverse turn so I could head back down the hill forward. Even the light weight of the V Star made it impossible to push up the hill. The trip back down to the flat intersection of Polk and Lombard was an interesting balance of more and less pressure on the brake. I really didn’t want to be on that part of the Lombard Street, but it was the only way to get to the part I wanted to descend, the one-block, eight-curve, brick-paved section that the street is famous for. I didn’t get to ride it on that trip, but will return some day. I can chuckle about it now, but I was cranky then from the jolt of my fried clutch. I chuckle sometimes too at the thought of my friend who did ride it, but got stuck behind a group of tourists from Korea in a rented land yacht who stopped periodically to take pictures. What follows is a picture of the curvy part of Lombard Street, and links to google maps for the curvy and straight parts of it. The google items should be interactive so you can move along them up or down. The featured image above is me sitting on the bike as a tow truck driver attaches it to his truck. Iron Mountain Road is a 17 mile stretch of U.S. Highway 16A that winds through a beautiful section of the Black Hills in South Dakota. But truthfully, to say it winds does not pay due respect to this asphalt work of art. It twists and turns, climbs and falls, squeezes through tunnels, and corkscrews back on itself in a way that forces riders to go slowly enough to appreciate the beauty. The official description includes 314 curves, 14 switchbacks, 3 pigtails, 3 tunnels, 2 splits and 4 presidents. Four presidents? Yep. One end of 16A is near the entrance to Mt. Rushmore National Memorial, and riders are treated to a view of Messrs. Washington, Jefferson, Roosevelt and Lincoln off in the distance through the tunnels. I am there to attend the 75th Annual Sturgis Bike Rally. Bikers who come to the rally come to party or to ride, and as I begin my trek along 16A, I hope that those groups are mutually exclusive. The first section of mostly gentle curves allows me to nudge the throttle just a bit, only having to rein it in approaching a few sharper ones. But soon, I reach what seems to be a continuous string of pigtails, tunnels and switchbacks. The first of the pigtails appears, seemingly out of nowhere just after leaving a narrow tunnel, and I quickly downshift moments before I’m led around a 360 degree turn and pass under what looks like a wooden bridge supporting the road I’ve just traversed. The ride overall is a full body, mind and sensory experience. It’s not just the exquisite sensation of my body leaned into the curves, but the absolute, full attention and immersion in the moment, the deep-throated growl of the engine, the vibrations reaching me through the seat and handlebars, the changing smells cruising past different vegetation, and the alternating coolness and warmth on my skin as I pass into and out of shaded areas. I nod to the presidents as I exit the last of the tunnels but do not stop for a selfie with them. It’s time to get myself on into Keystone for a well-earned cold one now that my ride is finished, and let my body and mind reflect on the wonder of it all. As I park and climb off, I notice a fellow biker wearing an Iron Mountain Road t-shirt that reads simply “What Dragon?” I smile as I remember I’m wearing my Tail of the Dragon shirt with the map on the back. We will have much to talk about. 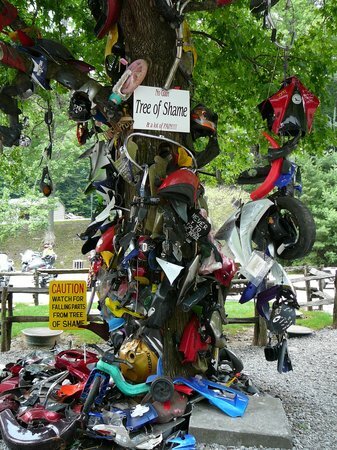 At the North Carolina end of the Tail of the Dragon stands the Tree of Shame, a tribute of sorts to the bikers who have been bested by the beast. The Dragon: a stretch of US Highway 129 with 318 curves in 11 miles, running from Tabcat Bridge in Tennessee to Deals Gap, NC. The Tree: adorned with fragments of bikes that missed one of those curves, a fender here, a shard of windshield there, poignant words about bikers who sustained more damage than their bikes. Is it wise to ride The Dragon? It is not really as scary as as The Tree might have you believe. It merely likes to taunt. I won’t let it dissuade me. The better question is “Can I not ride The Dragon?” The sensation of going into a curve on a motorcycle is unique. It can’t be had in a car. And with its 318 curves, The Dragon periodically beckons me to come glide down its twisting form. And I heed its call. Plus, I guess I’d be described as a prudent rider. No aspirations to break the 9-minute one way record. Not going to literally “skid in broadside in a cloud of smoke” as I ride it. And certainly no interest in adding parts of my beloved S 50 to the tree. Just a steady push to the comfortable edge…oooh those curves!